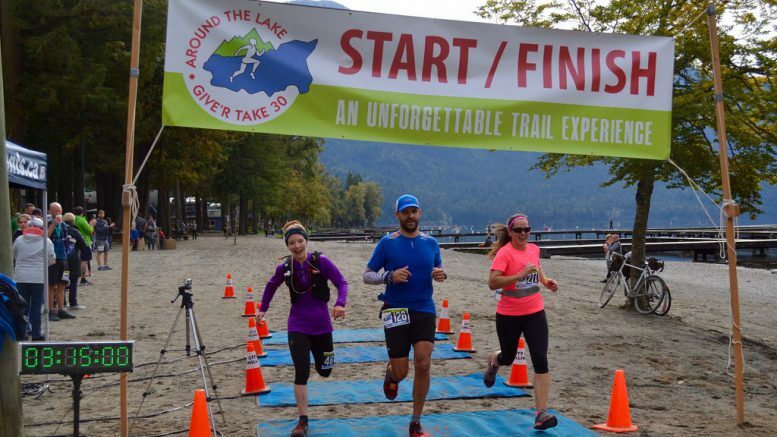 Cultus Lake – A number of new course records were established in this weekend’s (October 13) 16th Annual Around the Lake Trail Race at Cultus Lake. Aided by perfect conditions on a beautiful sunny day, the fastest time around the 30.2 km course was set by the male relay team of Kevin Barata and Brandon Jones from Abbotsford, who smashed last year’s course record time by almost half an hour, with a time of 2 hours, 24 minutes, 41 seconds. Second place went to another Abbotsford duo, Russ Esau and Ryan Shepard, at 2:27:42. The women’s relay was taken by Chilliwack’s Laurie and Regan Bogue in 3:11:03, while the mixed team of Leighann Parker and Brent Zieffle of Mission came in at 3:04:28, just 9 seconds ahead of Helen and Darcy Lainchbury of Abbotsford. The first solo 30k course athlete to cross was Victoria’s Karen Thibodeau, in a time of 2:37:59, shattering last years’ time for first female by 18 minutes. Lora Bartel of Chilliwack was the second female at 2:59:44, while the first male to finish was Chilliwack’s Mike Hanninen in 2:50:57, followed by Duane Foley of Langley in 2:57:00. Nine of the twelve 60k ultra runners who started early in the morning managed to complete the tough double loop of the course. Mathieu Schneider of Chilliwack set a new record in 7:09:28 (previous best time was 7:17:41), followed over an hour later by Chilliwack’s Matt Slykhuis in 8:16:01. Rachel McTavish was the lone woman to complete the course in 10:00:15. There were 344 participants registered for the event, comprising of 141 runners in the 30km solo race, 94 teams of two competing in the relay event with legs of 17kms and 13 kms, and 16 in a 60km ultra race. However about a dozen athletes ended up not being able to participate due to previous injuries or commitments. Full results can be viewed at http://aroundthelake.ca/results/. The race is organized by a committee of volunteers, under the auspices of the Around the Lake Trail Race Society. Funds generated through registrations and sponsors has allowed race organizers to hand out thousands of dollars over the last 15 years to local non-profit organizations. Next year’s 17th annual Around the Lake race will be held Saturday, October 19. Be the first to comment on "Records Set At 16th Annual Cultus Lake – Around The Lake Trail Race"